The star of In The Name of the Father, The Usual Suspects and Romeo + Juliet dies after a battle with cancer. 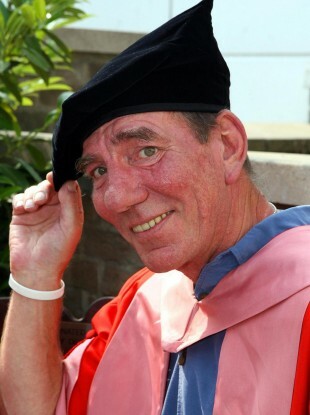 Pete Postlethwaite, seen in 2007 receiving an honorary degree. He died yesterday at the age of 64. OSCAR-NOMINATED ACTOR Pete Postlethwaite has lost his battle with cancer, it has been confirmed. The 64-year-old star – nominated for his role as wrongfully-imprisoned Guiseppe Conlon in In The Name of the Father - passed away peacefully at a hospital in Shropshire yesterday, having stopped work in recent months as his condition became more serious. After beginning his career on the stage, he made his name on-screen in Distant Voices, Still Lives (1988) before rising to worldwide prominence for his portrayal of Conlon in the 1994 Jim Sheridan film In The Name of the Father, telling the story of the Guildford Four who were wrongly convicted of an IRA bombing in 1974. He went on to feature in other hit movies of the 1990s, including Baz Luhrmann’s adaptation of Romeo + Juliet, and The Usual Suspects. As recently as last year he had appeared in box office smash Inception. In 2008 he had returned to the stage – and to the Everyman Theatre in Liverpool where he first started out – to play King Lear, a role he was said to always have wanted. Postlethwaite had been made an OBE in 2004 and had once been described as “the best actor in the world” by Steven Spielberg, who had worked with him on the Jurassic Park sequel The Lost World, and on Amistad. Email “Hollywood veteran Pete Postlethwaite dies at 64”. Feedback on “Hollywood veteran Pete Postlethwaite dies at 64”.